Making a strong joint isn’t too hard, but making a good looking one is surprisingly easy. With a little extra work you can have a good looking, calfee-esk bike. Important: For heavier riders (i.e. 170+ pounds or 77+ kilograms) I would highly recommend using carbon tow, hemp bast fiber, hemp rope or belt for your joints. The additional tensile strength of these braided materials will increase the rigidity of your joints and decrease the likelihood of breaks. 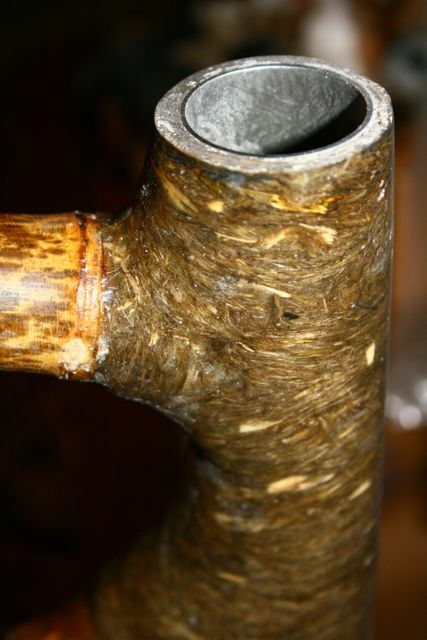 One good, and tried and true option is to buy hemp bast fiber from an offshoot of Stalk Bikes. You also might look into using raw hemp bark fiber sold here, I haven’t used it or even touched it, but I might be a good material to use since it has longer strands. Although I think it would require separating it into thinner strands. Might be worth talking to someone at hemp traders first just to make sure you think its a good idea also. Or order the fiber sampler from them first. Well before you start reading my methods read through what is in all reality a much more comprehensive and professional description of the correct building method. This was kindly provided by Zack @ Stalk Bikes in Oakland. Before you start, make sure that everything is as it should be. Of particular interest here is whether your rear wheel fits, how straight it is, etc. I would recommend bringing your tacked frame to a bike shop and have them use their dropout alignment tool. Keep in mind it doesn’t need to be perfect but might as well get it right…. First start by making sure to sand everything down properly. Epoxy does not adhere to the waxy outside. Remove it with 80 grit sandpaper and use some solvent too like acetone (although this stuff is nasty, use a respirator when applying or use something a bit less toxic like this). If you use acetone let it dry for 15 minute before applying epoxy. It should look like the bracing shown in the first picture on this page. 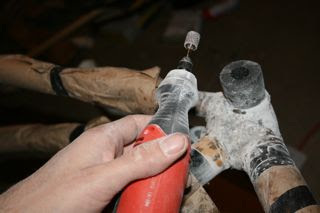 Although I forgot to, you should ‘wet out’ the sanded parts with epoxy before starting to wrap the joint. This will ensure proper adhesion, see video. 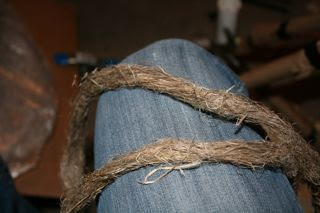 Now take some hemp fiber carefully make a 1 and 1/2″ wide strip of it. Keep in mind that you want a consistent layer of this stuff, so make it even. Lightly roll it in your hands to make a very loose rope like product. Although making a tight rope seems appealing, it is not. For two reasons, first you want as much overlap between fibers to make a strong bond, and second, with a tighter rope it is difficult to get proper coverage. Wrap one layer of this (about 1/4 inch thick) where you want it and pin it with a clamp. 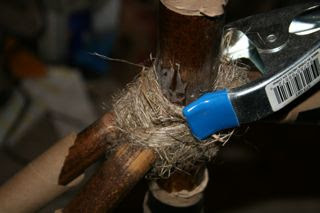 You can also use a glue gun to pin down the end of the rope (very handy). 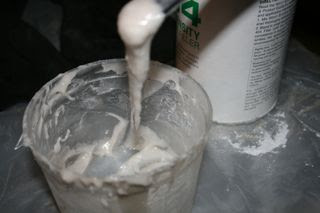 Then mix your epoxy and apply until you think you have just saturated the hemp. The metal clamp… very handy. You can use a hitch to finish up the end of a rope or you can use it to switch the direction of your wrap. Above I used a piece of pipe insulation to try to keep epoxy out of the treads of the bottom bracket. Not sure if it worked yet. If I don’t come back to complain, assume it worked. NOTE: the pipe insulation worked Ok, not great. Tips for next time. Try rubbing some of your bike grease on the threads first. 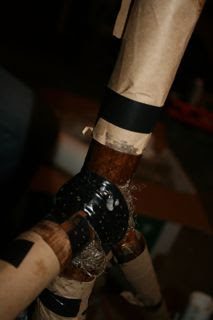 Then shove some pencils or something into the pipe insulation (try to over-stuff it, it will expand a bit into the threads, thus keeping the epoxy out). 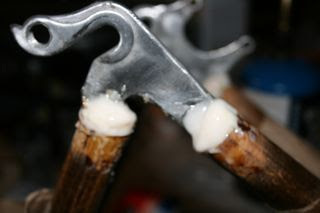 It is important to not put too much epoxy (reduced tensile strength) but not too little either. I add epoxy up to the point where compression with my applicator stick pushes up a small amount of epoxy from the surface. Make sure that work it into all the nooks etc. As with many other composite materials (such as reinforced concrete), the two materials act together, each overcoming the deficits of the other. Whereas the plastic resins are strong in compressive loading and relatively weak in tensile strength, the hemp fibers are strong in tension but have no strength against compression. Try a practice one to get a feel for it. 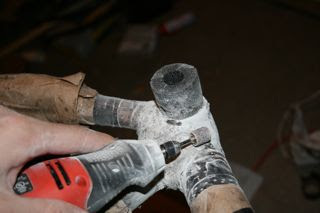 In the picture below you can see some epoxy being pushed out of the perforated electrical tape as I apply pressure. Now to reduce the amount of epoxy and to compress the fiber, wrap the area with the perforated electrical tape (sticky side out). I try to pull as tight as I can without breaking the tape. Wipe off the excess resin as you go. After the tape is applied, I massage the area, in an attempt to work the epoxy deeper into the fibers and to remove any excess. Here’s an example. Let it set. Oddly enough the epoxy doesn’t stick to the tape too much. Take it off well after the epoxy is no longer sticky to the touch, after 2 1/2 hours depending on how hot and dry the area you are working in is (epoxy sets much quicker in high temps). It doesn’t matter if you let it set over night either. You will be able to remove it relatively easily. Just make sure to sand it before applying more epoxy. Here is the first application. The next 2 layers I will concentrate more on the aesthetics. Add more layers progressively until you think you have added too much. Important: Try to apply layers so that fibers criss-cross as much as possible. If all of your fibers lineup in one direction, for instance horizontally, then they will provide no strength to forces pulling at them vertically. You need a matrix of fibers, not a train. Important: Your joints should be 1/2 to 3/4″ thick and should extend down the tubes about 2 1/2″ to 3 (on all sides on tube) to make sure your joints are adequately stiff. Additionally, don’t make any assumptions about which joints are the most important. I made this mistake when I decided that I didn’t need to build up the joint between the downtube and the headtube. I gave it one wrap, didn’t build the joint 2″ down the tube, and did minimal prep. In the end a crack formed at this joint and gradually loosened on me. Don’t make this mistake. Keep in mind my bottom bracket (likely the joint taking the most stress) and all other joints held up perfectly, so I am still a firm believer in hemp epoxy joints. 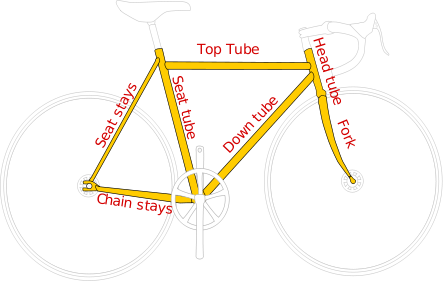 Although I have no scientific evidence, from the diagram above, the most important joints run all along the bottom of the frame (dropout to chainstay, chainstay to bottom bracket, bottom bracket to down tube, and down tube to head tube). 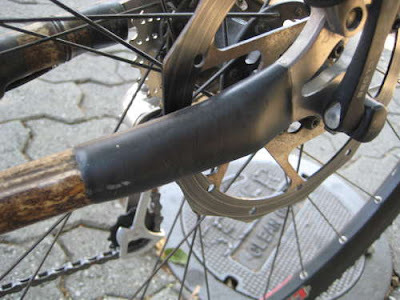 Apparently the rigidity of the seat tube is also critical, so make sure you sink a bit of metal in as described here. Now take your dremel and sander/sandpaper and have at it! The mini tubular sanding disks for the dremel work extraordinarily well, to get a very even surface a normal sander comes in handy too. Try them out you will be surprised. It will save about three years of your life. Get one, you wont regret it. You can shape the joint down to a nice looking calfee-esk thing in a few minutes. Depending on your desires, you might want to add a polish coat of epoxy to clean it up nice (there are also color addatives if you want to go funky, like this one). NOTE: If you build the joint out to the waxy part of your poles (the unsanded part) you can easily cut away excess resin with a razor. This allows you to make a nice clean edge between your joint and the bamboo. This sharp edge can then be shaped using your dremel sander. Note: If you want to go with the black joint look on some of the calfee bikes I believe he uses an outer layer of thickened epoxy (404 high-density filler) with graphite additive. See below for more info. Also a reader, fox.gao from China just paints them black. It looks surprisingly good. After applying all the resin I used my dremel to cut the headtube flush. I used the reinforced cutting disk, it can cut through anything. I used 404 high density filler to both fill in the bamboo tubes near the dropouts and to build then outwards an inch around the poles. I expect these joints to absorb a fair amount of shock and weight so Im hoping they will last. Thick like mud… don’t use the micro fiber filler, its nowhere near as good as 404 filler. Final step of course is to wrap it. Bottom right picture shows me apply more fiber to an area that I over-sanded. 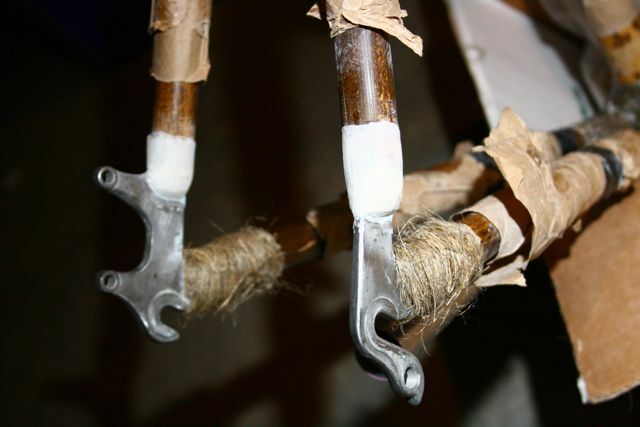 Although its not a death sentence of an sort, with a unidirectional matrix (as shown above) there is nothing to keep the epoxy holding individual fibers from tearing apart. Make sure that you criss-cross your fibers and use multiple layers. Surely the best builder in the field is Calfee. Here are my thoughts. First it looks like he is using a graphite additive here from west systems to get that nice dark look. Second I interpret his use of epoxy here as a plug. You build up the bottom bracket arm so that it is level with your tubes using thickened epoxy (additives from west systems) or using your fiber/epoxy mix. 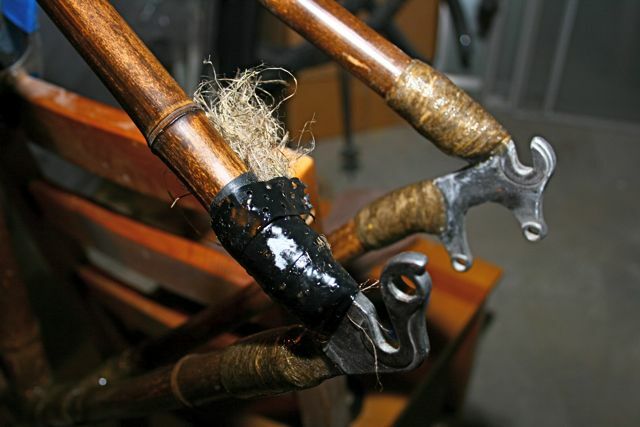 This plug will take most of the force off of the bamboo and put it directly onto the metal arms. Then its just a matter of building it up some more and then sanding the hell out of it until you have a pretty looking thing. From the picture below we can see that you need to think about the shortcomings of bamboo also. 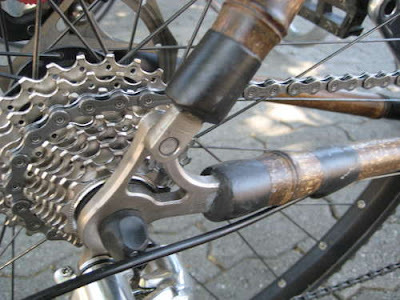 Since he is using a disk brake here he knows that additional force will be placed on the chain stay on that side. So he builds out some extra support for it. This is why my rotor didn’t fit. See how calfee uses a bent dropout arm? 67 responses to this post. I’m happy to report that the hemp fiber joints are plenty stiff, (although I ended up add an extra layer of hemp/resin to one end of the top-tube to stiffen it). I would say however if you are looking to make a high-performance bike (ie racing) you should use carbon fiber, or “carbon tow” which is much cheaper. Love the post, great job on the wet out! I’d suggest using a longer hemp fiber for future builds. The stuff from hemptraders is decent (built 2 frames with these) for adding general stiffness but they cut it down to shorter lengths and are generally meant for composite molding. In wrapping joints it’s better to use longer fibers to have both the mechanical advantage of having straight fibers (in multiple directions) than simply building up bulk stiffness. I’ve noticed much better results in flax stricks (expensive but a pleasure to work with), cordage (harder to wet out and compact), sisal (harder to comact) and long hemp fiber (favorite – there’s a supplier on ebay). These fibers are generally at least 2 feet long and have a good anchoring base for wrap, allowing better fiber orientation. For extensive use, the short fibers are more likely to delaminate during failure than the long ones because they lack any mechanical anchoring and are purely dependent on the shear strength values of the epoxy resin. Can you send a link to the long hemp fibers? Search for long hemp fiber, hopnshop123 sells it. Rad stuff to work with. 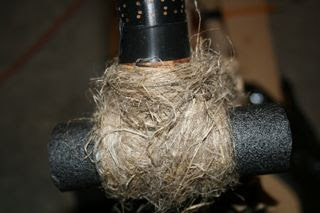 How much of the 10 LBS of hemp fiber did you use for one bike? Haha… well lets just say that I am now the proud owner of about 7 pounds of hemp. Although the loose fiber works well, you might consider using thin hemp cord, belt, or even strips of hemp cloth. The structure of the rope, cord etc will increase the rigidity of your joints. I plan on elaborating about it on my blog, but just haven’t gotten to it yet. Send more questions if you’ve got them. Thanks for the quick response. Lot’s of good info in one place on this blog. I’ve got my frame jig just about built and am (like the person in the above post) deliberating between carbon fibre and hemp. I think I’ll try hemp first for some “rough drafts” and once I’ve fine tuned a design I like, make one with carbon fiber joints. 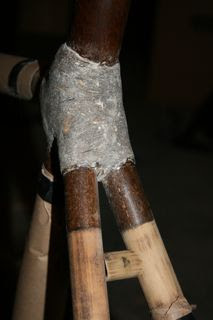 I am personally using carbon fiber tow for my joints, but I have recently found bamboo fiber and bamboo yarn available. Have you ever heard of anyone using that? It would be really cool to have an all bamboo bike. I have read about someone using bamboo fiber. They didn’t say much about it… good or bad. I do however think that the tensile strength of yarn would not be high enough. You want to use materials that you cannot rip easily with you hands. Bamboo yarn doesn’t work, it’s generally separated with very short fibers. Bamboo fiber although strong enough, is not the most sustainable natural fiber to use – their isn’t an efficient industry standard for mechanically removing fibers from the stalk and most manufacturers (primarily Chinese) utilize a harsh chemical process for the fiber separation. Really great stuff here. I’m working with Craig Calfee on the Bamboosero project. We’re looking to publish some “white papers” regarding specific techniques and materials Craig has used over the years and incorporates into his trainings. What specifically would be a good topic to write about? Hemp vs Carbon? Bamboo treatment? With Bamboosero, our main goal is to increase awareness of bamboo as a frame material but primarily to create sustainable employment in Africa! These are the top 5 site stats. Might be a good indication of interest. In the pictures it looks like you wrap the joint and then apply the epoxy. Is this correct? or do you dip the hemp in epoxy and then wrap it? I wrapped the joint and then drizzled on the epoxy and worked it in. Good luck! I don’t agree with your comment “Surely the best builder in the field is Calfee”, although he is well respected (by my myself included) and deserves acclaim, I have seen some far more beautiful and better built and better performing bamboo bikes out there. Is this the same James that is an extraordinarily talented and skilled artist-craftsman-sculptor of bamboo bikes, taught by Daryl Funk (I hear) and James works for Boo Bikes, (Nick Frey Owner), so of course he has a biased opinion. However, I love James work and his youtubes prove he loves doing it. Has anyone seen how the bamboobikestudio.com guys are using foam for the lugs and joints? Is there a benefit to doing it this way? I apologize for posting the same question twice…the first post I did with the link to the pictures above said it did not go through…didn’t realize it did until now. Why not just use a high test braided fishing line? It’s very low stretch, high tensile, and probably cheaper than carbon fiber. Carbon tow only costs about 8 bucks for 100 feet 6k count. Interesting idea though. You can sometimes find it on ebay for much cheaper than that even. I go 5000 meters of 12 k tow for $50 including shipping. I don’t know what fishing line is made of, but it seems that most plastics are incompatible / won’t bond with epoxy. Kevlar roving has the same incompatibility. I’m using 12k carbon tow and woven fiberglass cut into strips from a square-yard sheet. Cutting the tow into 6 or 12 inch lengths lets them separate out into a gauzy mat. Laying down the fiberglass strips and the gauzy tow, then wrapping tightly with tow straight from the spool, seems to work well — I’m not using the electrical tape technique. I tried Kevlar thread today and it seemed to soak up the epoxy nicely, still not sure on the final result though. I am considering buying epoxy and hardener to start building, for starters, one bike. How much of the West Systems epoxy and hardener should I purchase for one bike? I was just wondering what the finish on your joint is? Is it just the epoxy on the top layer? Or did you put an actually finish on it? Just finished with epoxy… nice and easy. It seems that Panda Bikes figured out a way to join the bamboo to their steel fittings without a wrap. I like that look. Any guess how they did it without sacrificing durability/strength? If one were to go the carbon tow route, would epoxy still be the appropriate choice? hi guys great blog. I am currently in the process of building my first bike here in the uk. I want to make my joints out of carbon tow wrapped in either hemp or sisal fibre for additional bulk and aestetic appeal. 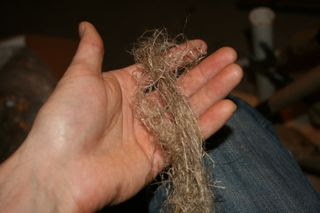 However I am really struggling to get raw hemp fibre here in the uk. I have looked at hemp traders but they are selling hemp fibre at $20 a kilo before delivery (seems expensive, is it a good price? I dont really know). I was wondering if anyone knew of any alternate suppliers? Alternatively I was considering buying hemp or sisal marine rope and unravelling it to get at the fibres for an easier wet out. will this work? has anyone done it before? New Zealand has the flax plant that has fibres strong enough to make rope and linen. Another organic fibre is from coconot husk and pacific island people have used this as the strongest rope for centuries. I think these fibres would work perfectly as matrix material in resin. I am using manila hemp rope that I have unravelled. It is working pretty well so far! Went with manila rope because it is supposedly stronger than actual hemp (not hemp, actually from banana plant). Also, I unravelled a 10 foot rope, so each piece that I wrap my joints with is one continuous piece. In case you were wondering, the Calfee bikes and the guys at Stalk Bicycles use Super Sap CLR Epoxy made by Entropy Resins. Thanks! I just included it on my page. Cool. I think that this site is really great with all the information that you are compiling. 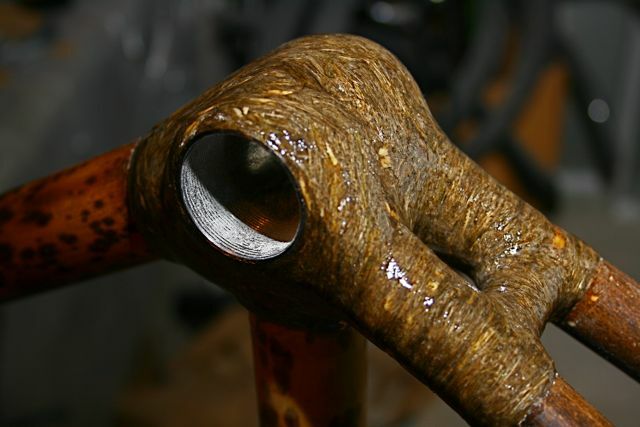 The one problem I had was using the West Systems epoxy because it’s not really a sustainable material like hemp and bamboo, so I wanted my frame to be completely sustainable…so I just had to figure out the epoxy that Calfee uses on his bikes. It would be really great if you could post this on the front page of this site and just ask people to go to the link, click support, and just quickly sign up for an account. Great site!!! I simply can’t find hemp fibers here in Brazil… An the supplier mentioned above has nothing to sell. Can you help? I can buy on line and have it shipped here, but I can’t find it. Super Sap is great, just as good as West in my opinion – check the data sheets. What would you do if you didn’t have any resin filler? I live outside the U.S. and cannot buy West products, so I’m not sure if I’ll find something like it. I’m thinking maybe pre-wrapping the dropouts with some fiber and epoxy then squishing them inside the bamboo tubes, then wrapping around. Any other ideas? Geat blog. Do most species of bamboo require anything beyond light sanding and flashing off with acetone before epoxy resin will adhere to it? Are there any other prep strategies. Is this a pretty good assumption? How much bamboo is wasted to make a single bicycle? Twice the weight of the bamboo culms used to make the tubes? Are you interested in getting a copy of the report when I am done? Thanks in advance for any information you can provide. Yeah I think it sounds about right. Although I don’t think in grams. As for the bamboo. If you harvest your own bamboo poles you will likely have more issues. Depending on the type, 1/2 to 1/3 will split while drying, maybe more. If you have trouble with locally sourced bamboo, kiln dried and treated bamboo should be much more reliable. As for the report, I would love to see it when you’re done! Let me know if you want me to post it on the site if you want. Do you have an email address I can send the report to? Has anyone been able to source hemp fibre in Australia? Where are you sourcing your drop outs from. I guess they must extend a fair way into the bamboo in order to be stable when under stress? First of all thank you for your work gathering all this information! I’m thinking about building my first bamboo bike and will i was researching i saw this photo ( http://www.eirinika.gr/images/datafiles1/32638.jpg ). 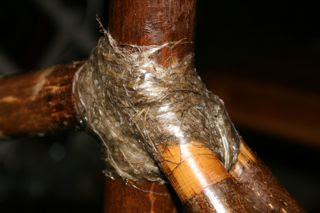 I think they have scared the bamboo on the joints for the hemp to get a better grip thus creating a stronger bond. Has anyone tryed this technique? 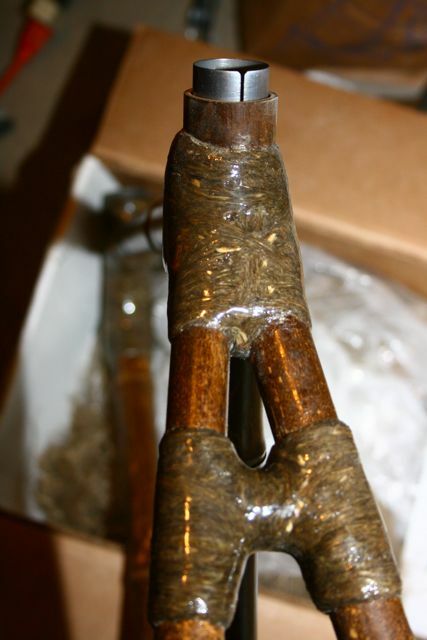 I’ve noticed that some bamboo bike frames have dark brown joints whilst others have a lighter almost creamy finish. I quite like the former and was wondering if this finish is achieved using a specific type of hemp (processed, unprocessed etc) or if the hemp darkens naturally when whetted by the epoxy resin application. How thick the epoxy resin that is to be used with hemp should be for best results? 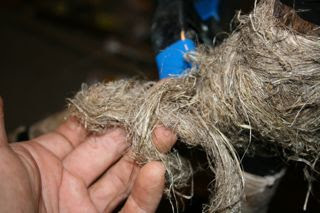 Manufacturer’s recipe for resin and hardener proportions, a soaking of the twine then further coat(s) until a pure resin layer has smoothed out the wrinkles of the hemp twine. Judicious sanding with 400 grit, wet and dry corundum or silicon carbide paper followed by a thin layer of epoxy for that shiny finish. Looking for this to. This joint is a real beauty!! Waiting for my parts to ship, as we speak. Hi! This is really helpful. I am doing a project for our facilities planning subject and I chose Bamboo Bikes as the product. Do you have a post about the complete process? 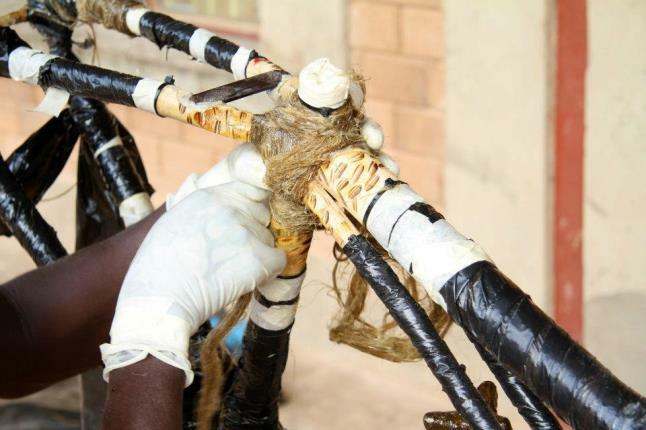 From very first to the last process of making a bamboo bike? Please. I need help! Thanks!! That resist epoxy actually adhering to the fibres makes little difference in the structural integrity and strength of the joint. 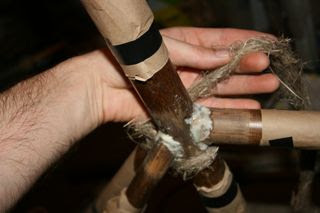 Similar to a multiple section fishing rod and its wrapped joints being support rather than attatchment.